Pink! its the colour of the season. Pink really was the colour of the season. Far too early one Friday morning, I found myself in Heathrow airport about to get on a plane for the first time in a decade. I was alternating between nervousness and excitement. Just as I was starting to panic, Lynne and Michael arrived and we checked in and got through security in record time. I really enjoyed the flight. I love looking out of the window at the clouds below. At Helsinki airport we were met by a group from Out’n Loud, including my host for the weekend, Mathias. We got our weekend travel cards from Mikko and then Mathias drove Lynne and I back to his flat. We had been there only a few minutes when Mladen and Paul, who were also staying with Mathias, returned from their day of sight seeing and suggested that we go out for dinner. We got on the bus and went to a great Italian restaurant in Helsinki Centre. We’d heard that a lot of the Pinkies were going to a nearby karaoke bar so we decided to join them. 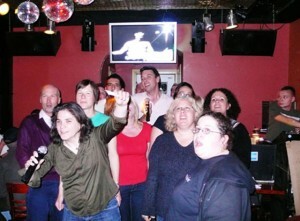 The bar was full of Pinkies and Out’n Loud choir members, all of whom were singing their hearts out. I was really tired so I didn’t stay long but before I left, I joined in with all the other Pinkies there singing Angels. The next day, I had a quiet morning dozing on Mathias’s very comfortable sofa before going off to the rehearsal. The rehearsal was made far more interesting because at least half the choir had colds. So all through the rehearsal, throat sweets, paracetemol and cough medicine were being passed around. There was a great piece of music on the wall which made me laugh. If you didn’t get a look at it there then here are some links. It’s definitely worth a look. We moved into the actual hall which had amazing acoustics, and the Helsinki choir joined us to practice the joint song. After all the panicking we’d been doing to try and learn the words, it turned out that they didn’t know them either! We left them rehearsing on stage and went off to find lunch. After lunch we went to try and find our dressing room. It was somewhere in the deepest darkest basement, but it did really have a mirror with light bulbs all the way round it! Having got ready we hurried to the balcony so we could watch the Out’n Loud choir’s performance. They were really good, though I wished I could understand the words. And then it was time for us to perform. 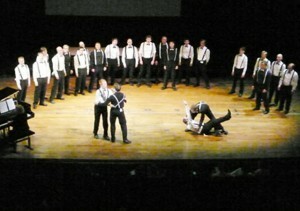 I think we were brilliant, though the great acoustics in the hall probably helped. The Abba encore got a few laughs and I could see that the audience were enjoying it. The joint song went well too. Then it was off to one of the strangest parties I think I’ve ever been to (and I’ve been to some really weird parties!). The bar area downstairs was huge, which was great. There were sofas and quieter areas as well as the dance floor and bar. And of course there was the sauna. Don’t you always find saunas in nightclubs? It was very interesting, listening to past Eurovision hits, watching sweaty gay men wearing nothing but towels on the dance floor. I’m sure if I was a gay man I would have really enjoyed it, but as a lesbian it was an amusing but slightly disturbing experience. Lynne, Mathias and I got home at about 3am and considered locking Mladen and Paul, who had gone home earlier, in their room so they couldn’t wake us up too early in the morning. Unfortunately we decided against it and so far too early Sunday morning, we were woken up by Mladen and Paul who had decided we were going out to breakfast. We went to a little café which claimed to serve English breakfasts. I don’t think they quite understood how unhealthy English breakfasts are supposed to be though, as they seemed to contain rather a lot of fruit as well as the traditional bacon and eggs. Then Mathias kindly took Lynne and I sight seeing around the city. We went to the Lutheran Church at the top of a huge flight of stairs, the Church in the Rock, the market by the harbour and the view of Helsinki from the top of the tower. At every stop we bumped into more Pinkies who were also cramming in some sight seeing before travelling home. There were quite a lot of us pinkies on the flight home. I was shattered and I think I slept most of the way. Having to get on the tube after an amazing weekend like that was a bit of a let down but it was good to get home. I had an amazing time on my first Pinkie trip aboard and am really looking forward to Paris. Thanks guys for making the weekend so special.